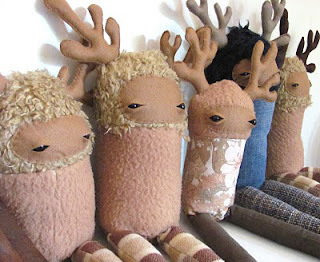 I've been in love with Pepper Stitches' Antler Boys since I first saw them. 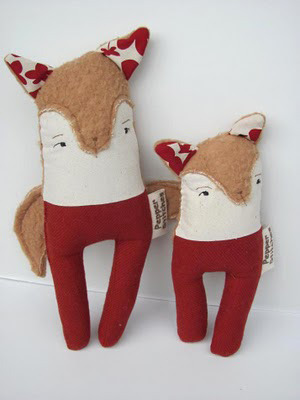 And just look at those foxes! They are so quirky and adorable... not your run of the mill softies. Shaz, a.k.a. 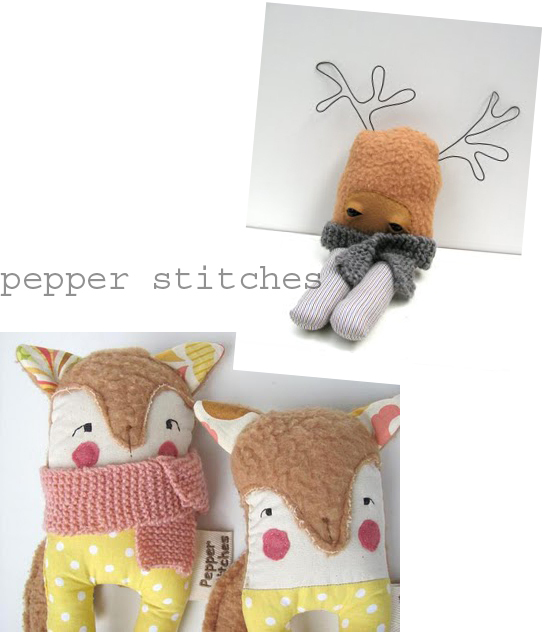 Pepper Stitches, creates her unique handmade toys and homewares here in Sydney from new, repurposed and upcycled materials. Earlier this year Shaz took a big step and left her stressful day job and got herself a studio space in a warehouse full of other artists. I asked her to tell me some more about her self and her creations. I’ve always loved finding out things, and making things, as my mum can attest. I was forever sticking things together and sewing and wondering how things worked. We grew up without TV and with encouragement to use our imaginations and find out things for ourselves. 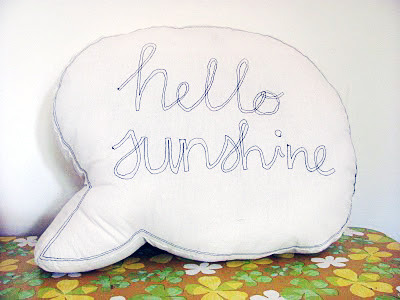 I enjoy lots of creative outlets, but sewing has always been special to me. 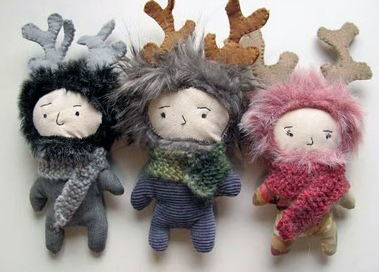 It’s so visceral, you can hold and hug and love handmade toys in a way that is different than drawings or painting (although I love them too). My love of op-shops, vintage fabrics, the challenge of designing and making new things out of old things, and a bit of eco-awareness has all led me to create Pepper Stitches. I love sourcing fabrics that would otherwise be discarded or forgotten and giving them an opportunity to be appreciated again. It’s lovely to be making beautiful things and help the world a bit at the same time. I find inspiration everywhere, the fabrics I find, dusty libraries, forest walks, children’s picture books, friends and family, art. I find other bloggers and creators very inspiring too, and can *ahem* spend hours reading blogs and checking out etsy. I’m very grateful to be able to do what I love every day, and the wonderful crafty-lovin’ community out there; the support and encouragement has been awesome. People are becoming more interested in where things come from, and the processes used to make them and I like the connectivity of creating something and telling the story of the materials it came from, and then receiving emails or notes from the recipient, of knowing some stories of where my pieces end up. I put a lot of myself and my heart into what I make, and I hope that shows. You can read more on the Pepper Stitches blog, see more on flickr, and buy these awesome little critters on etsy, made it, and blue caravan.